Participants : Jerome BECHU [correspondant] , Fabien BENUREAU, Haylee FOGG, Hugo GIMBERT, Matthieu LAPEYRE, Olivier LY, Olivier MANGIN, Pierre-Yves OUDEYER, Pierre ROUANET. ErgoRobots is a hardware platform for showcasing a number of curiosity and learning behaviours for the public to interact with. The platform can also have future uses inside the lab for experiments that require more than one robot to complete. Although this system is entirely new this year, a very different previous version existed with the name FLOWERSField. It consists of five ErgoRobots, a control system, an interaction system, a display system, a sound system and a light system. There is an external system which monitors the ErgoRobots which contains a control system, a power system, a surveillance system and a metric capture system. This system went live on October 19 2011 without lights which will be added in late December. 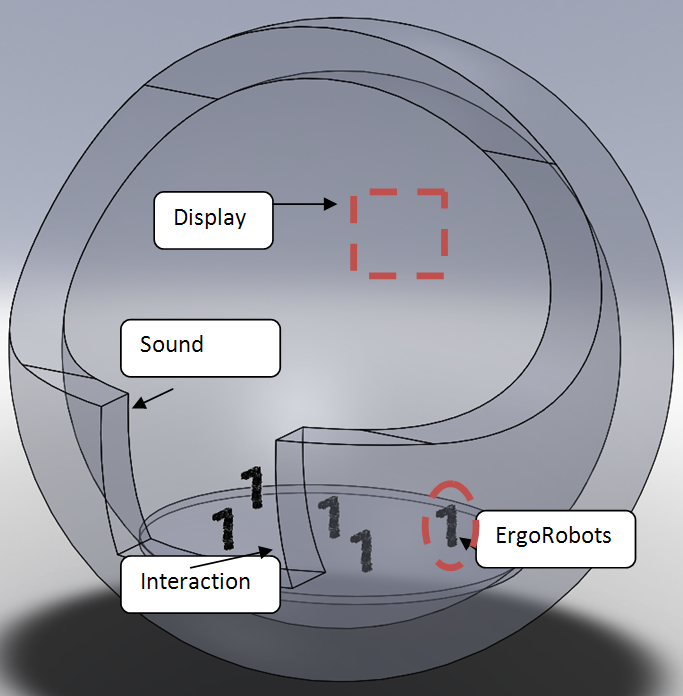 The Ergo-Robot system: The robots themselves are each composed of six motors (see figure). Currently, the heads of the robots have been created in wax by David Lynch and the entire system is displayed at Fondation Cartier inside a large egg shaped orb as shown in the following diagram. The control system module contains both an MMNET1002 control board with an UART-RS485 breakout board which communicates with a ubuntu Linux PC via an ethernet cable. The mment board communicates with the motors, but all other ErgoRobot systems communicate with the PC directly. The sound system is currently externally provided and communicates with the PC. 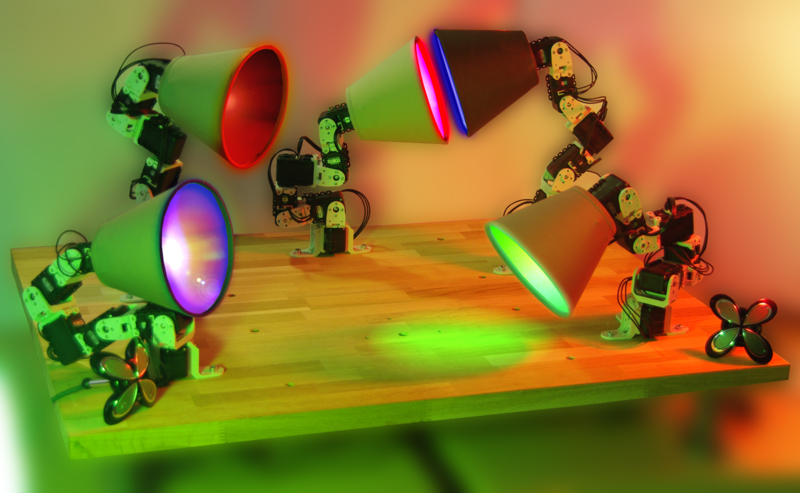 The light system is a series of two or three BlinkM RGB leds placed inside each ErgoRobot head that are controlled through two LinkM USB devices directly with the computer. A kinect placed in front of the system operates as the means for the public to interact with the platform and communicates directly through USB to the PC. The display system is currently an externally provided projector that projects visualisations of the field's current state behind the ErgoRobots. The external system: This system allows anyone that is monitoring the system to externally control the ErgoRobots system. The PC with which the software control takes place is a Ubuntu Linux system which communicates with the ErgoRobot control system via an ethernet cable. The ErgoRobot harware system can be managed by an external power system which includes a 15.5V bench top power supply for the ErgoRobot motors, an external 12V plug in adapter for the mment board, an external 5V plug in adapter for the LED lights which are all controlled via an emergency stop button. The maintenance system can be located out of direct view of the ErgoRobot field as it has a surveillance system: a kinect that can display the current state of the field. More surveillance is conducted through a metric capture system that communicates with the ErgoRobots to obtain various state values of the ErgoRobots through the motor sensors and other data. This surveillance is not entirely in place as of 2011 and will be implemented in early 2012. Participants : Jérôme BÉCHU [correspondant] , Pierre-Yves OUDEYER, Olivier LY, Fabien BENUREAU. We continued to develop the FLOWERS FIELDS/Robot Lamps experimental set-up, see Figure 14 . This set-up explores new forms and new functions of robotics. When we think of robots, we traditionally have in mind either humanoid robots that look like humans and are supposed to do similar things as humans, or industrial robotic arms which should work in factories. On the contrary, the future may come with unforeseen kinds of robots that may enter our everyday homes: for examples, as houses become themselves intelligent with domotics, we could imagine that furnitures themselves could become robots. Chairs, tables, televisions, or lamps may become robots. In FLOWERS FIELDS/Robot Lamps, we show robotic lamps which move like living entities, with their own moods and their own system of interaction. They can be thought to be in houses partly as aesthetic objects, and partly for their social presence. Indeed, not only their movements and sounds are life-like, but they are sensible to human presence and can become interested in looking and interacting with people through those movements and sounds. In the future, we could imagine additionally that these robot lamps could serve as a friendly interface with the numeric world: for example, some gestures may be used towards the lamps to tell their hifi system to play a given song in your library. This year, a major update of the platform consisted in shifting the whole servomotor technology to the RX Robotis Series, allowing much more robustness and sophistication of control. The software was adapted to these new motors, requiring indeed a new mode of control together with a new electronic board. This installation was demonstrated in march 2011 at the INNOROBO International Summit on Personal Robotics in Lyon. Participant : Haylee FOGG [correspondant] . The Humanoid Robot Torso is a hardware platform that is intended for use in the lab for either experiments or demonstrations. It consists of a humanoid robot that contains just a torso, arms and head. It is entirely new this year, but it has been updated once during the year. The previous version was inspired by Acroban and consisted of 20 degrees of freedom. The update began in November of 2011 where 3 degrees of freedom was removed from the spine and one degree of freedom was removed from the head. The Torso has two arms. At the time of writing one arm consists of a three fingered claw that is controlled by a single motor, and the other is just a flat push mechanism. The arm with the claw contains seven degrees of freedom (including 'grip') and the other only five. The torso itself has two degrees of freedom. The head is soon to consist of an iPhone for the face and a separate usb camera for the 'eyes' with the ability to move in two degrees (pitch and roll) in early 2012. 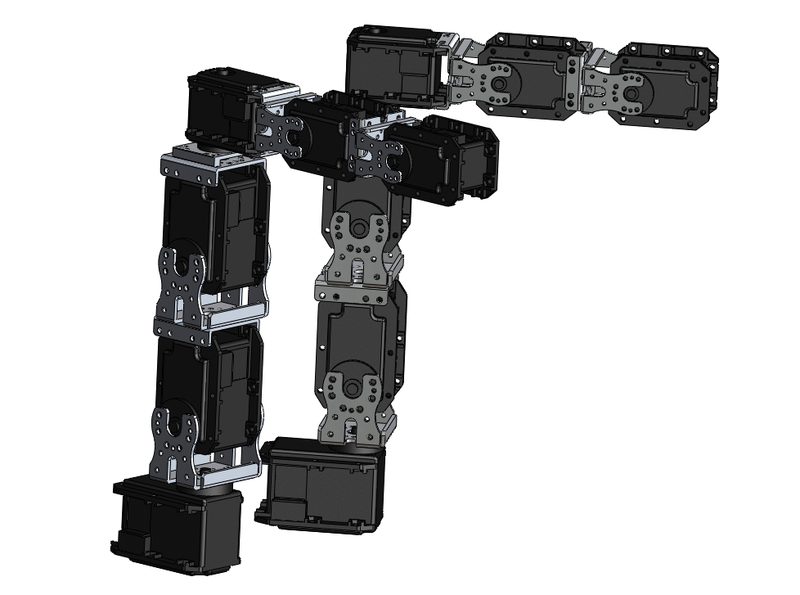 The hardware is both robotis Dynamixel RX-28 and R-64 motors attached together with standard robotis frames and a substance called polymorph. Polymorph is used to attach a series of springs and elastic to many of the degrees of freedom to increase smoothing and absorb backlash of the motors. Polymorph was added in November 2011 to replace the previous versions metal that was tooled in the lab. A method for controlling the motors of the Torso will be under review in 2012.